The Facebook discussion on my last blog post was really helpful - it made me realize that I should have been much more explicit about what I was discussing regarding timeframe and class level, and I plan to update the other post to reflect that in a bit. But I also thought it would be worthwhile to talk about the situations where my suggestion is not useful, for balance (and because it lets me talk about the early 18th century, i.e. the best part of the 18th century). 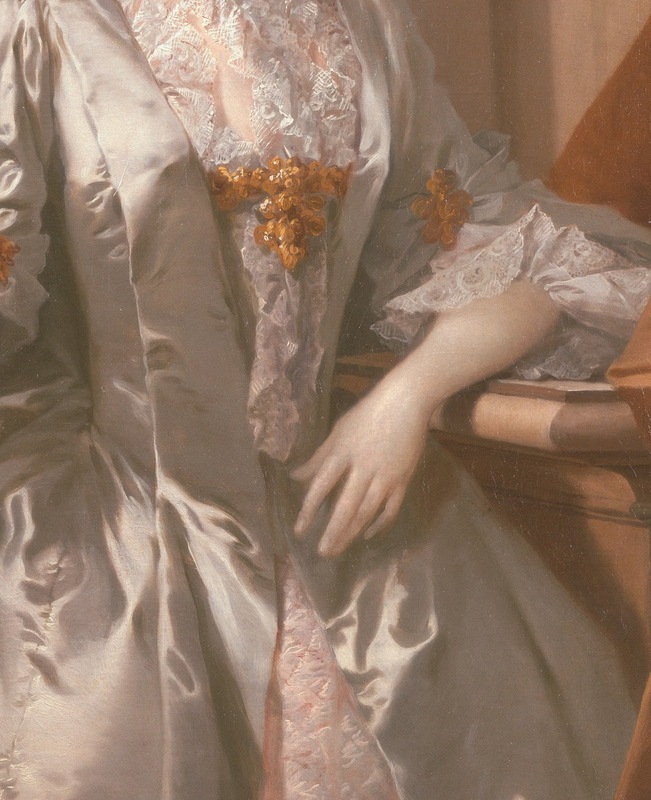 To recap and clarify: my point was that portraits and images of fine clothes from the 1750s, 1760s, and early 1770s (in the Anglo-American, British, and French contexts) generally show women with gown, petticoat, and stomacher made of one fabric, and that when they are not all the same, you are more likely to see the stomacher not match the other two than a petticoat that contrasts with a matching gown and stomacher, and that the stomacher and petticoat matching each other and contrasting with the gown is an even rarer look. The most obvious group to which the previous post doesn't apply is the one that couldn't afford to buy enough fabric to make an entire ensemble in the same material, or perhaps even to buy anything but disparate secondhand items! Let's hear it for the female bruiser on the ground, the tavern maid, the prostitute's servant (as well as the prostitutes themselves, often), and all the women in "The Recruiting Sargeant". While they don't show the specific matching stomacher/petticoat combinations, they ignore the fashionable fully matching "suit". So I don't think there's any "rule of thumb" when it comes to the middle classes except that those who could afford the higher-status fashion of a fully matching outfit likely would, and those who couldn't, likely wouldn't. ... a brown lustring night gown, fresh, and looking like new, as every thing she wears, does whether new or not, from an elegance natural to her. A beaver hat, a black ribband about her neck, and blue knots on her breast. A quilted petticoat of carnation coloured satten; a rose diamond ring, supposed on her finger; and in her whole person and appearance, as I shall express it, a dignity, as well as beauty, that commands the repeated attention of every one who sees her. 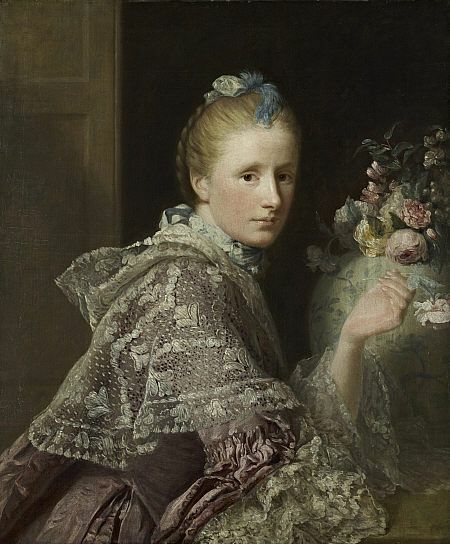 A number of eighteenth century portraits, especially women's portraits, were done in clothing that they would not have worn on the street or in a drawing room. 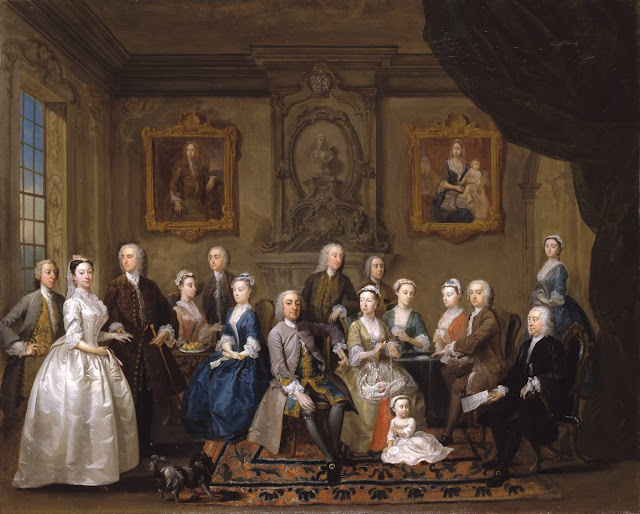 Anne Buck notes in the introduction to Dress in Eighteenth -Century England that "evidence of eighteenth-century dress from its portraits is confused by fashion in painting itself. From the 1730s fashionable people were often painted in a version of seventeenth-century dress, after the much-admired Vandyke. From the 1760s they submitted to the convention of being painted in a compromise between the contemporary style and the dignified ambiguity of classical draperies. Some artists imposed a dress, which though fashionable could be peculiar to the portrait and not the usual wear of the sitter"; later in the book she points out that "sitters who were from the beginning antique could never look merely out-of-date. Even the unsophisticated wife and daughters of the Vicar of Wakefield are made to have ambitions of being portrayed in this way." I've previously written about "antique costume" here, and have a Pinterest board for hoarding more images. While it can reflect notions of what is currently attractive, it can also reflect what's seen as interesting, unusual, or historical. The "exotic costume" based on Turkish women's dress very frequently made use of over- and undergowns that can also give the impression of gowns with contrasting petticoats and stomachers. Now we get to the real meat, and also turn back to fashion. Despite liking the first half of the century possibly more than the second, I left it out of my earlier analysis because, in the costuming world, "18th century" in effect means "after 1755": rounded hoops broad stomachers (or post-1775 closed-front bodices), stripes, flounced sleeves, larger and often powdered hair. But there are a lot of different things going on in the earlier part of it. For now, I'll just be concentrating on the situation with stomachers and petticoats. At the turn the century, there are a number of things happening - mantuas worn open over (what appear to be) stays, mantuas that closed at the center front, full suits with everything of the same fabric. A lot of images from this time are heavily classicized, but of the less classicized portraits and genre scenes, the matching gown and petticoat with contrasting stomacher seems to prevail. In the mid-1720s, a round gown - round in at least the skirt - begins to take over fashion, and its reign lasts through the 1730s and into the 1740s. Open skirts do exist at the same time, but they're surprisingly uncommon when considering how much they are part of the stereotype of the entire century! Contrasting petticoats cannot be seen when worn under a round gown; quilted, and therefore not matching, petticoats are most commonly seen under open gowns. Stomachers across the board tend to be either depicted as a shade of white or completely hidden under the neck handkerchief; in many of the cases of apparently hidden stomachers, they may not have even been worn, the handkerchief or tippet being directly on top of the stays. In the 1740s, though, the round gown subsides to be on par with and then overtaken by the ordinary open mantua, and petticoat choice is important again. At this point, contrast - sometimes through quilted petticoats, sometimes not - is fashionable, although the stomacher still is white or hidden (or non-existent). By the 1750s, the fully-matching suit which usually includes a visible, broad stomacher is in fashion, as discussed in the previous post. And now let us skip up to the late 1770s, when stomachers begin to fade out of use. This means that we've completely left the almost-nonexistence of the stomacher/petticoat pairing behind, and are only considering the commonness of the matched or unmatched gown and petticoat. 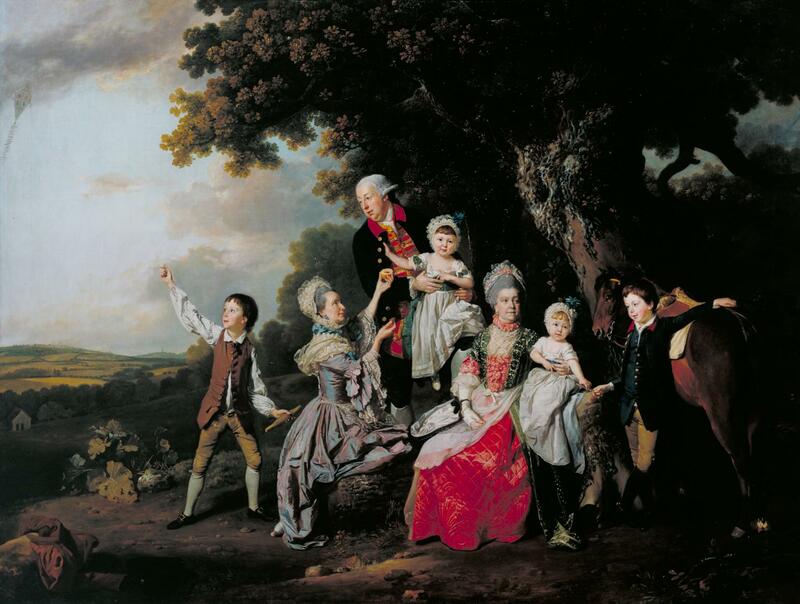 A great many extant ensembles, fashion plates, and portraits attest to the continuance of the matching ensemble; satirical prints, on the other hand, mainly show well-dressed prostitutes in unmatching gowns and petticoats. 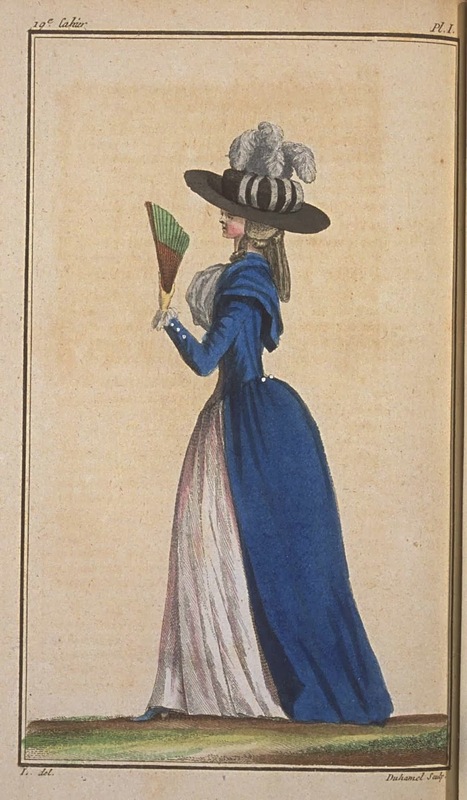 In fashion, the contrasting pieces show up first in the robes de fantaisie (turques, levites, polonaises, and so on) - enough out of the ordinary for women of means that the first one appearing in the (French) Galerie des Modes has to explain the vocabulary for the style: a coupé petticoat, "cut". 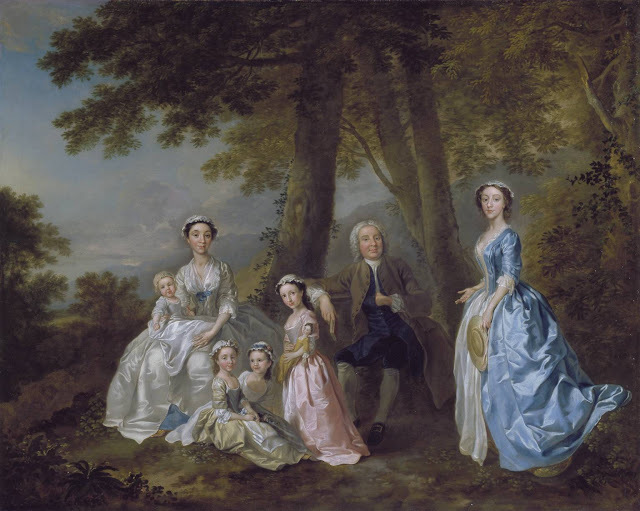 Over the course of the early 1780s, the coupé style goes from being almost entirely associated with robes de fantaisie (especially the levite) to being commonly shown with ordinary fitted gowns. I suspect that this might be due to the fashion of the period's fascination with idealized "country dress"; there might also be a parallel with men's dress, which was generally a bit less matchy throughout the century, and which was another influence on women's clothing at the time. This is so interesting! And I think really clarifies a lot of what you were talking about in the previous post. I was especially interested to learn about the prevalence of white stomachers under earlier gowns. I was wondering what was going on there because they're so frequently covered by the kerchief thingy. Thanks for sharing! I always appreciate your well-researched pieces...thanks for doing all the work and sharing it with the world for free! There are still little details like this constantly coming to light that are great for the historical sewing community. 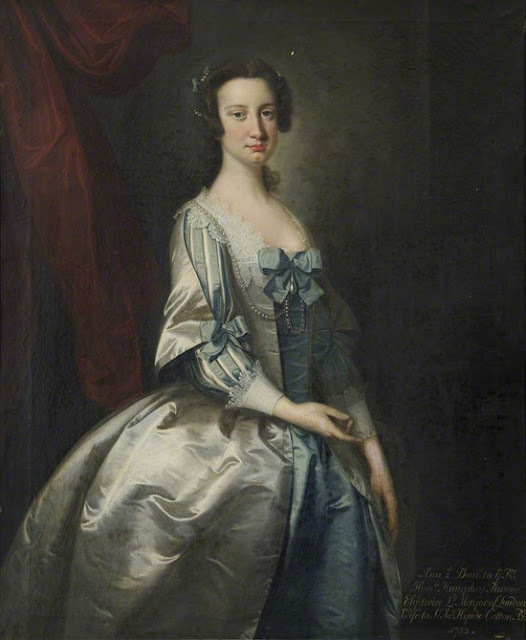 The recent revelation that you rarely see women in art with their neck handkerchiefs actually tucked in under the gown is something that had completely eluded me, so I was really glad of that conversation because I've been guilty of that even though I've looked at countless artworks portraying 18thc dress. The stomacher matching the petticoat has always looked super tacky to me when done in patterned fabric...very Simplicity Halloween-y, so I'm glad to see it likely wasn't all that common even with solids. Ditto on all the praise for your research and writing! Thank you so much for sharing this wealth of information with us!